After training 3 long hard months, we are finally here! The greatest Polynesian outrigger canoe race begins on Wednesday. 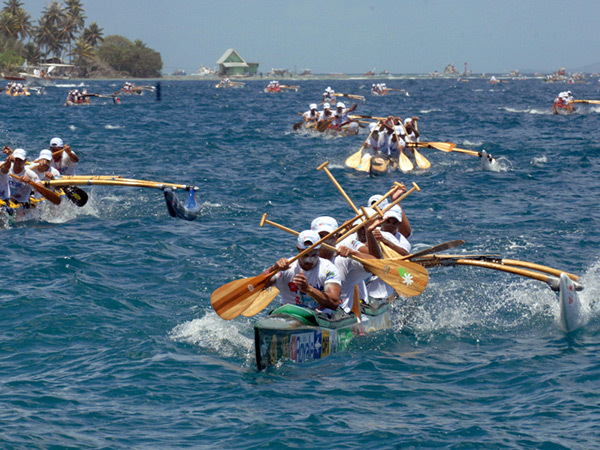 A much waited, competition, it is considered as the ultimate « va’a » race (Polynesian outrigger canoe). Each year, at least 5,000 people meet for this occasion: staff, volunteers, competitors and spectators. As in previous years, the race course takes us around the Leeward islands, between Huahine, Raiatea, Taha’a and Bora Bora. Last Saturday was a crucial day for many Polynesian teams as they set to ship their racing canoes on the « Tahiti Nui IX » cargo to Huahine. This 22nd edition of the race promises to be a success again. Organizers are expecting 118 teams of rowers for the race: 71 senior teams, 17 veterans, 17 juniors and 13 female teams. It promises cutthroat competition. 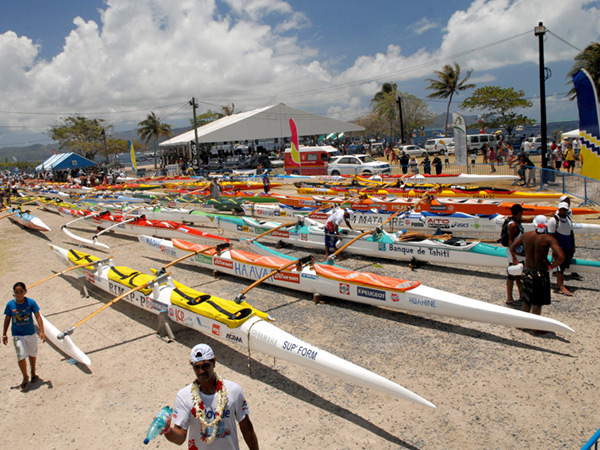 Shell va’a, EDT and OPT teams will be favored to take the top three titles of the competition. But we all hope to upset this forecast. 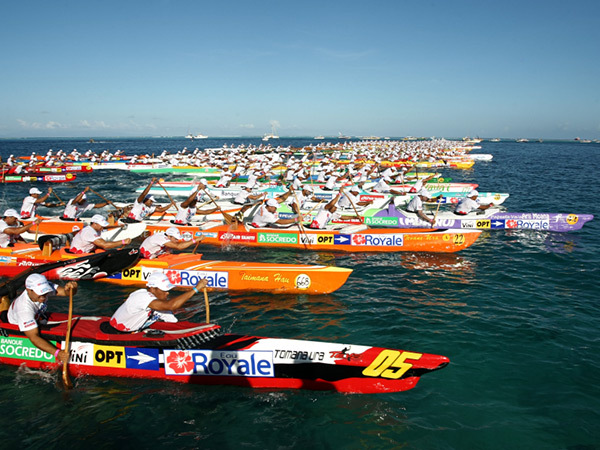 This race is really challenging tests all paddling skills on different fronts, from the open ocean to the quiet lagoons. Today, we passed an important step of the race preparation: the weigh-in. As per race regulations, all the canoes must be weighed by the organizing committee. 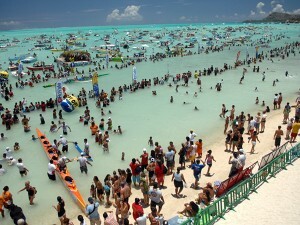 The objective is to regulate the weight of all “vessels” to avoid unfair race advantage. 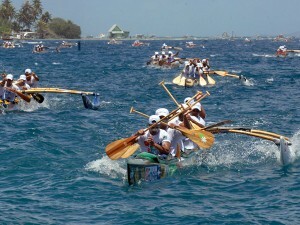 The minimum weight for an outrigger canoe is fixed at 330Lbs. The lighter canoes will receive extra weight. The heavier canoes, not worried by the regulation, naturally “pay for it” on race day. This shows the growing importance of canoe manufacturing. The material put into the making of a canoe plays a significant role in the final result. Aside from force and sheer endurance, another difficulty will be to clear our path between the canoes and the numerous spectator boats for a sleek course to the finish line. 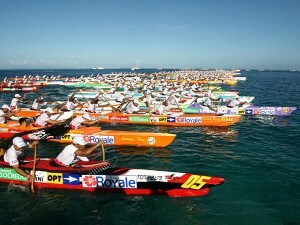 For this, strategy and the course chosen by the “pépéru” or rudder man (6th man on the canoe) are crucial in the race. Remember, we sail for 129Km during only three days; what a crazy race ! We all hope to « swipe » the first prize (1.200.000 XPF) and break the previous record of 9 hours and 35 minutes. The pressure is now on till race day on November 06.